If you’re afraid to eat nuts because they are high in calories and you are convinced they will make you gain weight, know that the type of fats nuts contain are GOOD for you and studies have shown nuts actually help DECREASE excess body fat when eaten as part of a healthy diet. Nuts are best eaten raw, but dry roasted nuts have benefits as well including ease of digestibility. If you are allergic to one or more nuts, you should avoid them completely, though some poeple (including myself) have a mild tree nut allergy where raw tree nuts cause a histamine response, while roasted ones do not. 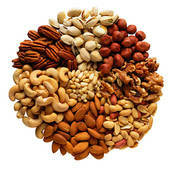 Nuts are excellent sources of minerals, proteins, monounsaturated fats and other nutrients. Eating just 1.5 ounces a day may reduce the risk of age related degeneration of cognitive skills, motor abilities, heart disease and risk for some cancers. The omega-3 fatty acids found in nuts can alter the effect of chronic stress on the body by reducing the production of several pro-inflammatory biochemicals in the body which lead to age-related disease. By far my favorite nut, almonds are a great source of calcium, magnesium, Vitamin E and selenium. They are also the most alkaline of the nuts – typical American/Canadian diets are way too acidic, and acidity is a breeding ground for disease, so consuming more alkaline foods is always helpful. Almonds also help support colon health and reduce LDL (bad) cholesterol. High in selenium, brazil nuts reduce the risk of heart disease and cancer and also play a role in reducing allergies and inflammation. That being said, due to it’s high selenium content, it’s best to have no more than 1-2 serving twice per week. As well, it is high in oxalates, so if you have a history of oxalate-containing kidney stones, it’s best to limit consumption. Walnuts are full of heart-healthy omega-3 fatty acids, contain ellagic acid known to fight cancer and support the immune system and have anti-inflammatory properties important for controlling asthma, arthritis, eczema and psoriasis. A good source of minerals and lower in fact than most nuts. The fat they contain is the heart-healthy oleic acid. Known to reduce cholesterol, pecans are also an excellent source of 19 vitamins and minerals. Pecans were the nuts used in the studies on weight and body mass index. Subjects consumed about 3.5 oz. of pecans per day (459 calories and 44 gr of fat), yet their body mas index and weight remained unchanged. Highest in monounsaturated fats and high in portein, fiber, potassium and magnesium, macadamia nuts also lower triglyceride levels. Macadamia nut oil is also stable at much higher temperatures than olive oil or canola oil. Peanuts, as most people know, is actually not a nut at all, but rather a legume. Another well-known fact is that peanuts are a highly allergenic food. This may or may not be due to the overwhelming amount of aflatoxins, a poison produced by the Aspergillus flavus fungus, which grows well on peanuts. A known carcinogen, it is 20 times more noxious than DDT. Peanut also contain large amounts of oxalates (see brazil nuts above)……Although peanuts do have similar health benefits as other nuts, in my practice I generally recommend to limit or avoid their consumption. Commercially prepared peanut butter should be completely avoided since they use hydrogenated stabilizing oils which are hazardous to the cardiovascular system. Pine nuts are high in magnesium and potassium, two minerals whose combined effects product a strong, healthy heartbeat, lowered blood pressure and improved blood flow. In addition to lowering LDL (bad) cholesterol and raising HDL (good) cholesterol, pistachios contain a compound with anti inflammatory effects. Another study demonstrated pistachios as effective against jaundice. Individuals who are allergic to mango and cashews should avoid pistachios as well, since they are from the same family. Do not consume pistachios with red dye. Now that you know how great nuts can be for you, toss some nuts on your next salad, in your next cup of organic yogurt or use them in your baked goods. Enjoy! Source: The Encyclopedia of Healing Foods, by Michael Murray N.D.